OrientExpress is a Windows application for automatic Laue indexing, developed by Alain Filhol at the Institut Laue-Langevin (ILL) with Jean Laugier and Bernard Bochu at LMGP Grenoble. It and can be downloaded with example files. Under the Data/File menu select "EXAMP1.DAT", which contains lattice dimensions for a ruby test crystal (Al2O3) together with the characteristics of the camera (distance to crystal, angle between the beam and the camera normal, wavelength range, and camera screen dimensions). Note that this is transmission Laue data, so the angle is 0o; it would be 180o for backreflection Laue. Al2O3 is given on hexagonal axes, but the programme can convert to rhombohedral axes, for which indexing is easier. You can look up lattice dimensions on the Inorganic Crystal Structure Database (ICSD). Under the Coordinates/Image menu select "examp1b.jpg" or a Laue pattern you saved from your camera. Select the Origin/Circle menu from the new "Laue" window that opens. Click and drag the red circle to define the beam axis of the Laue pattern (not always coincident with the centre of the beam hole) then click "OK". Select the Scale/Enter menu and enter the number of pixels/cm; 44.25 for the examples or 50 for the 150x120mm NeutronOptics Watec camera. Check these numbers at the top left of the screen. Now click "Measure coord." and click on up to 10 spots (right click to remove a spot). It is best to select only 5-6 spots that are at the intersections of arcs of spots (zonal lines) which usually have small h,k,l indices. Finally, click "Save coord." to a file. Note that the laue spots fall on ellipses, indicative of transmission Laue geometry; in backscattering geometry the spots fall on hyperbolas, the intersection of the scattering cones with the detector plane. On the OrientExpress main menu, click "Indexation search" and simply click "OK" in the dialogue that opens. If indexing succeeds, a red Laue pattern will be super-imposed on your measured image corresponding to one of possibly several solutions (click on the different solutions if there are several). A correct solution will reproduce the observed spots (plus a lot more) and most importantly, the intersecting arcs of spots. If there is no good solution, check the centering, scale and cell parameters or select fewer Laue spots only on arc intersections. The menu Coordinates/Modification modifies the coordinate list or centre/scale image constants. On the OrientExpress main menu, select Matrix/Refinement and "No additional coordinates" then click "Refine". Try refining again after adding more Laue spots. The resulting file "Report.txt" will list the (h,k,l) of all the Laue spots used for the refinement as well as their position on the pattern, their deviation from the calculated pattern, and the refined distance between the camera and crystal. On the OrientExpress main menu, select Simulation/Laue and then select the rotation axes under the Options of the simulation window. Dragging the mouse in this window will rotate the Laue pattern around the selected axes. You can also choose the Indexation option and click on Laue spots to identify them, increasing their size as necessary. 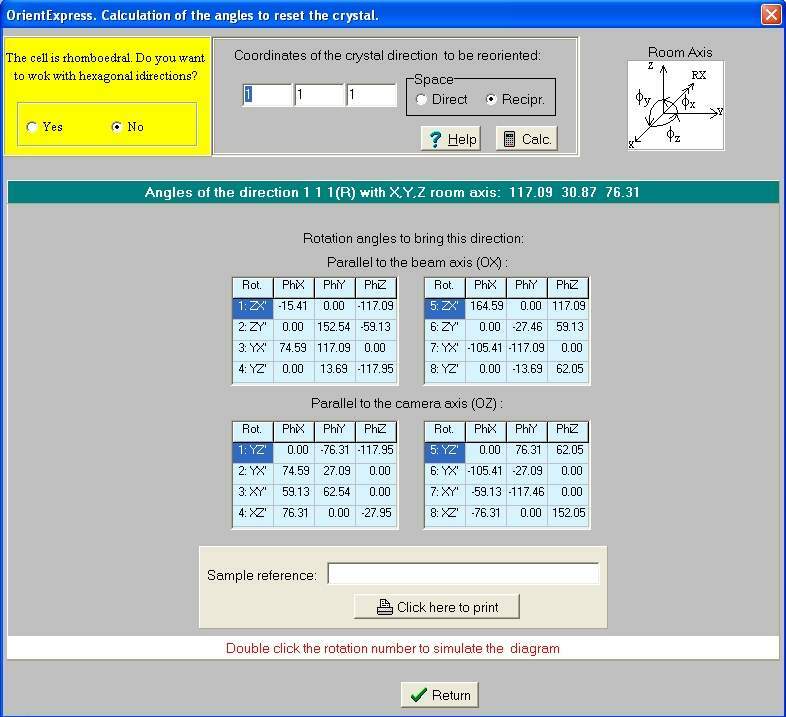 Even if you can't index the pattern, you can simulate it given the Ox,Oy,Oz crystal orientation axes by entering these under the Matrix/Acquisition menu then using the Simulation/Laue/Options menu as above to adjust the crystal orientation. 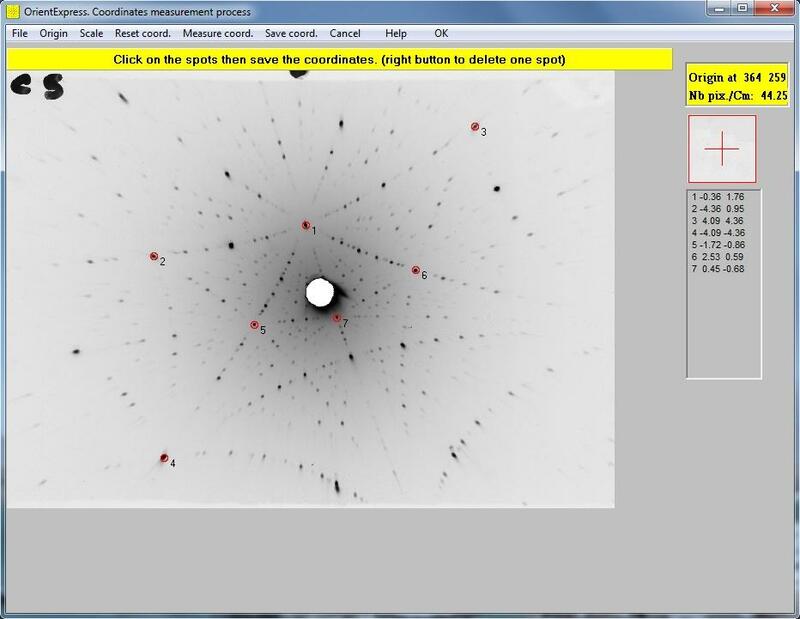 Steffen Weber has also programmed a simple interactive Laue pattern simulator in Java. 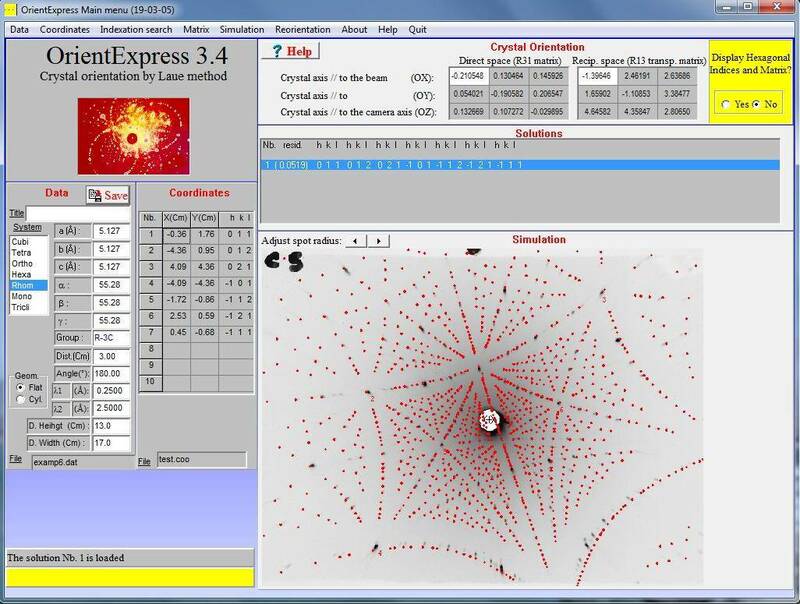 On the OrientExpress main menu, click "Reorientation" and enter the crystal orientation eg (1,1,1) that you want either parallel to the beam axis OX, or parallel to the vertical camera axis OZ, then click calculate. You will obtain a number of combinations of rotations phiX, phiY, phyZ that will achieve that. Choose the solution most convenient for your goniometer. Finally you can click on one of these solutions to display the expected Laue diagram, and you can check your new orientation by comparing that with a new measured diagram. For backscattered Laue patterns, the "Angle" in the data file becomes 180o as in the "examp6.dat" file. File "grolland.bmp" is a backscattered pattern from ruby where we have measured 7 spots (below left) which allows us to find a unique solution (below right). Note that we have chosen spots at the intersections of multiple arcs indicative of low order reflections in symmetry directions. Try removing the last 3 spots; you will still find a solution. Try adding spots at the intersections of fewer arcs; a solution is more problematic. Use only a few low order reflections to find a solution, then refine it. These brief instructions should be supplemented by the OrientExpress "Help" file. 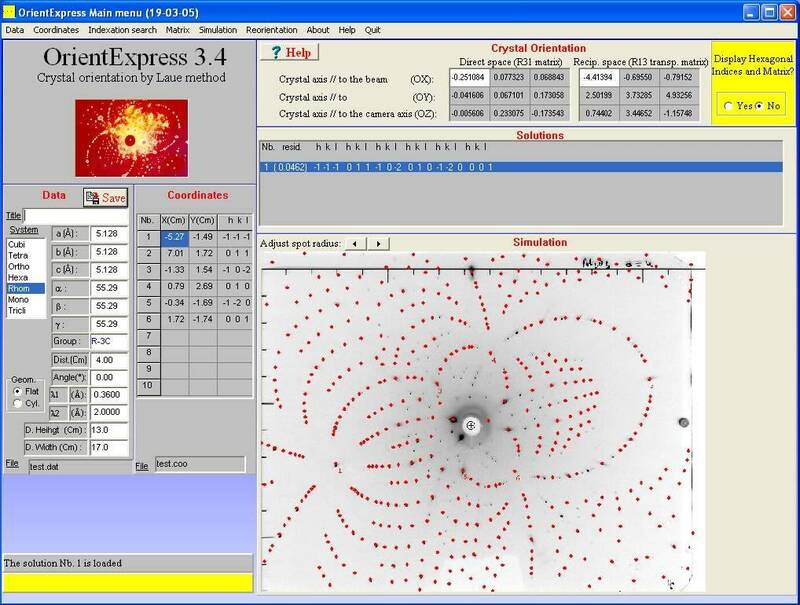 The Laue patterns shown here are the X-ray scattering examples provided with the OrientExpress software, not those obtained with our cameras. For Windows-7, install OrientExpress in write-enabled directories, not "Program Files". 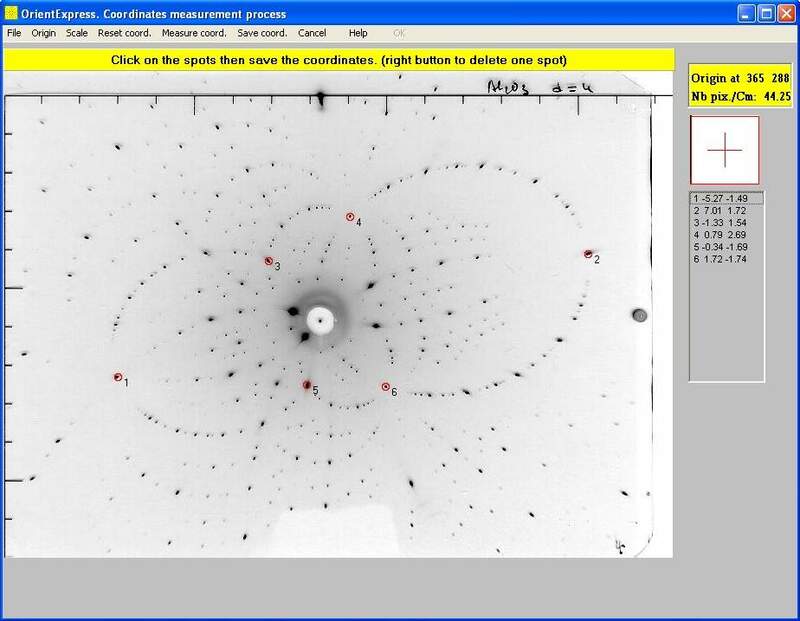 More experienced crystallographers will also want to use the Daresbury Laboratory Laue Software Suite and in particular the LaueGen application.